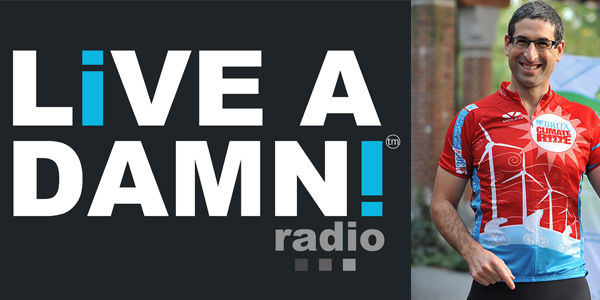 Just last week, Ecorazzi announced my latest project: Live a Damn Radio — a weekly radio program that spotlights the many world-changers who are raising the bar on social consciousness and taking meaningful action to create change. Whether we’re talking to altruistic celebrities, everyday heroes or hardworking organizations, Live a Damn showcases those who are going above and beyond to make the world a better place. On today’s episode, we chat with the host of the Sundance Channel’s hit show The Lazy Environmentalist, author and entrepreneur Josh Dorfman. Next, we crown restauranteurs Joy Pierson and Bart Potenza our Live a Damn Citizen Rockstars for their work with the New York Coalition for Healthy School Food. And finally, Woodstock Farm Animal Sanctuary’s Co-founder and executive director Jenny Brown stops by to share how living a damn for animals literally changed her life. Literally! All of this, plus our Live a Damn Weekly Celebrity Countdown, a groovy feature brought to you by Ecorazzi. Check out the episode after the jump or stop by LiveADamn.com to find out more. And remember, it’s good to give a damn, but it’s better to Live a Damn!